Hi I’m Dr. Kristen O’Dell. I have been successfully running detox programs in my private practice since 2008. I have finally found a way to offer these programs to the public outside of my patient population at an affordable cost. You will receive many of the same benefits as my patients while managing the program yourself! We have had the most success with two programs: a 10-day and a 28-day detox. 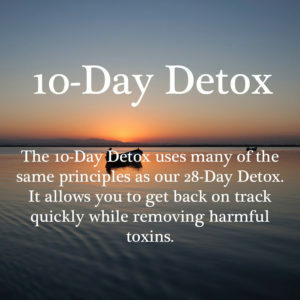 The 10-day detox is shorter, of course, than the 28-day program. It’s designed for people who simply need a reset. Maybe you’ve been on vacation, sipping tropical drinks and making runs to the buffet line 24/7; maybe you’ve just finished up a rough patch at work, the kids are nuts, and you haven’t sat down for a real meal with vegetables in weeks; maybe it’s the end of the holiday season and you need to press the reset button on your eating habits (is frosting a food group? ); or maybe you just need to kick some bad habits. You can get back on track. It’s not as bad as you think. We will help you bring down inflammation and bloating and get rid of those annoying cravings. GOLD ONLY: Video clips and information on how to live a less toxic life. Everything will be shipped to your home. Most people have questions… we try to answer the most common ones here. It is estimated that your body comes into contact with over 800 toxins a day. 800! Without any intervention, this can quickly lead to illness. Take the necessary steps to offset this burden by clicking one of the buttons below! The “GOLD” program includes supplements, all handouts, access to our Facebook group, and Priority Response. The “SILVER” program includes supplements and all handouts. Dr. Kristen O’Dell started her career in traditional medicine after graduating from Yale University. As a physician’s assistant, she learned quickly that quantity mattered over quality, and her brief encounters with patients made it impossible to offer complete care. She was treating symptoms, not causes. As an analytical practitioner who wanted to offer the best to her patients, she desired to learn more. What were their stressors? What was holding them back from health? Did they understand their own medical condition? Were they eating properly? Were their bodies being polluted by toxins? Were they sleeping well? The traditional medical model simply didn’t allow her the time to troubleshoot. Coincidentally, many patients were starting to ask about supplements, alternative protocols, and testing. The desire for better patient care coupled with an innate curiosity resulted in her transition to Naturopathic Medicine. Dr. O’Dell earned a Doctorate from Bastyr University in Seattle, WA in 2008 and moved to Bedford, NH, where she started a practice.